Architects are bound by law to design buildings that are accessible to the disabled, but the deaf often get left out of the equation. A group of designers and deaf students are now trying to change that—and their first building, a dormitory at predominantly deaf college Gallaudet University, is their manifesto. But back to the dorm. In Metropolis this month, Linda Hales details the process of designing a $18.5 million mixed-use dorm that’s uniquely suited to deaf students. There’s more to it than you might think. For example, stopped to open a door can interrupt a good conversation, since sign language is all about the hands—so LTL specified sliding ones. The same goes for the width of hallways. 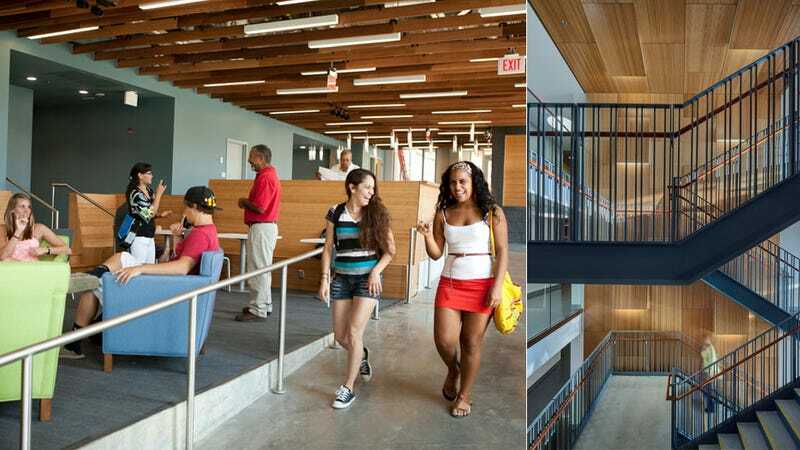 When your conversation with a professor depends on keeping your eyes on their hands, a narrow corridor, unexpected steps, or a sudden turn can kill the flow, so the dorm's hallways are almost twelve feet wide. Visibility is another huge issue. The interiors are painted colors that dull problematic glare, and there's plenty of daylighting—which reduces the eyestrain that comes with communicating in ASL. And what about lectures? If your view of a professor’s hands is blocked, you’re in trouble—so LTL and DeafSpace designed an amphitheater that’s optimized for perfect sight lines from any spot. Unexpectedly, acoustics also play a role: For students that use hearing aids, ambient noise is a major issue—so special acoustic panels and carpets dampen the junk noise. There are plenty more subtle details at work, too. One point that stands out, though, is that sign language is inherently spatial. It deals with the three-dimensional movement of objects through space. "Deaf culture centers around the language," said Bauman a few years ago. "The language has all the elements of architecture-the spatial kinesthetic of sign language, the desire of deaf people for the visual access that open space affords-lends itself to express the deaf way of being."